With PhotoMarks, Bits&Coffee is committed to offering the best possible experience for each platform, be it desktop or mobile. The desktop version has an elegant wizard-like interface with previews available for every step of the process, making it very easy to use even for the novice Mac or PC users. The iPhone/iPad version has a modern flat interface. PhotoMarks for Mac and PC is a fully-featured batch photo watermarking solution. The program can completely customize the appearance of text and logo marks, as well as perform additional edits like resize, rename, auto rotate, or decorate photos with graphical frames, all in the same session. It works by editing photos in batch mode and takes advantage of multi-core processors for speeding up the process. Settings can be saved as profiles to be easily reused later. PhotoMarks for iOS can easily apply multiple layers of text and logos on the image with just a few taps, The marks are completely customizable, and the resulting images can be saved, with no quality loss, to Camera Roll, or shared on Facebook, Instagram, Twitter, or sent via Email. Since 2005, Bits&Coffee has been developing and marketing image enhancement productivity software for business and home users. 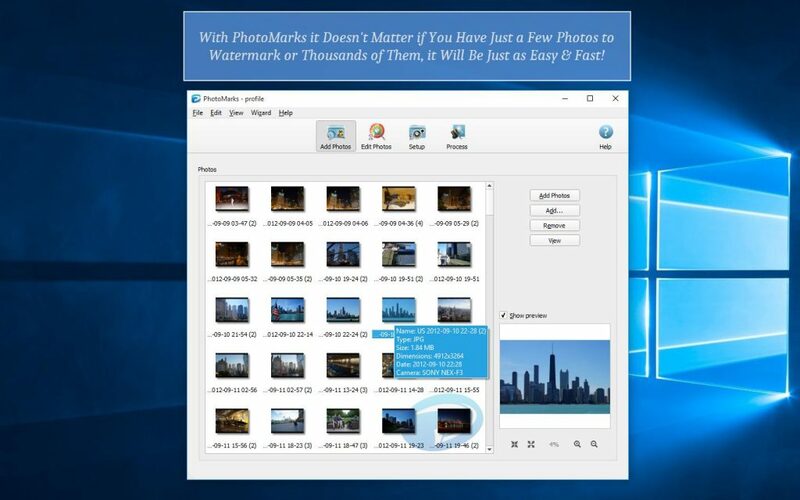 In addition to PhotoMarks the company also offers BatchPhoto, a complete solution for batch photo editing on Mac and PC, as well as Image Espresso, a free online image converter and editor.